What if you could tap into the minds of 3,000 marketers to find out where they stand when it comes to social media marketing? How valuable would it be to know how your peers are handing the time commitments, social media platforms and measurement? 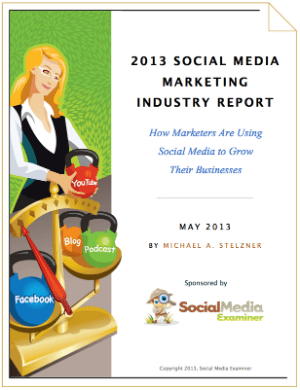 Lucky you and lucky me, the answers to those questions are found in today’s 2013 Social Media Marketing Industry Report from Michael Stelzner and Social Media Examiner. From the most popular forms of social media marketing to measurement, to integration with other digital marketing tactics, his year’s report offers answers as well asks more questions. Those additional questions “Top 5 Social Media Questions Marketers Want Answered” are just one section of the report and also the topic of this post. Below you’ll find the percentage of responses for each pressing issue and my thoughts on the answer plus resources for further exploration. Of all the questions answered by this report, identifying the most effective social media marketing tactics was the most important to respondents. Facebook, Twitter, LinkedIn, Blogging and YouTube were the top 5 platforms used by marketers in the survey. When answering this very important and popular question, there are a few important considerations. Don’t fall for a simple list of the most popular social media platforms since what works for another company may not work for yours. At the same time, don’t think that you have to conduct an exhaustive research project into which social platforms your customers are on before making any kind of social media marketing commitment. The practical approach is to make sure you’ve clearly identified business goals and outcomes you can measure as a result of a successful social media effort. At the same time, think about your customers’ goals and how a social presence for your brand will help make them happen. Then make sure you have a hub, whether it’s a blog or a social aggregator for your brand. Your actual tactical mix should be driven by what kind of social content and experiences will connect customers with your brand. After a basic review of social media monitoring for brand mentions and a look at your web analytics for social referring sites, stake your claim with the top 4-5 social networks regardless if you’re B2B or B2C: Facebook, Twitter, Google+, LinkedIn and either Pinterest or YouTube. You can cross post content from your blog and curated news on the web at large to the first 5. Once you have a rhythm for curating useful news and sharing your own content to these major networks, you can collect REAL data relevant to YOUR company and decide where to optimize your social media presence with tactics. By starting with the networks that include a mass audience customized by your initial insights from social media monitoring, web analytics and competitive research, you can shorten the time it takes to capture interaction data that is relevant and meaningful vs. the sweeping generalizations most often made about social media marketing channels. The next most popular social question to be answered for marketers is at the core of what being social as a brand means. How to engage with your audience? Profile your customers with analytics data, social media monitoring and direct surveys. Use that insight to find out the networks they spend time on and the topics that interest them. Review competitors social media activities to discover anything they’re doing that appears to be working as well as things that are not. Research and network with influencers in your industry. And not in a desperate “please can you share my tweet or blog post?” way, but in a meaningful way that adds value, “I noticed your question about XYZ, here’s a post on XYZ best practices you might find useful”. Monitor your community for advocates and recognize them! Nurture and support them, but don’t try to “buy them” with freebies etc. Seek out questions being asked on the social web that can be answered by your company’s unique expertise. Become a known resource for those topics by answering questions without being salesy. Curate those Q&As into a FAQ in your blog or website. The most successful formula for successful social engagement is also the simplest: Ask your network to do things that are easy and meaningful. Then recognize them for their contributions in a meaningful way. Repeat. Interestingly, more marketers are interested in executing tactics than measuring what works. This disconnect speaks to the difficulty in measuring social media ROI for many companies. What is your hypothesis about the contribution social media involvement will make in providing value to customers and improving your business? What problems will you solve for your customers through social media? What is your customer’s journey in the sales cycle and where does social media fit in that experience? Which social media tactics will help you best attract, engage and persuade your community to become customers? Answer those question and you’ll be able to map goals and outcomes to the social media tactics to be measured. You’ll also be able to make correlations between key performance indicator trends in social media with business outcomes. Check out “10 Questions for Social Media Measurement for Success” to dive deeper into how you can better measure your social media ROI. One of the most popular blog posts on this site over the past 3 years is this list of 22 Social Media Marketing Management tools. Cindy King from SME has also published a great list of 24 social media marketing tools too. There are so many tools available that it’s a bit like the wild west. Big promises of automagically monitoring, managing, publishing and measuring all your social media activities sounds too good to be true because it often is. In order for companies to scale their social media efforts, it’s essential to find the right tools to help perform social media monitoring, social content management, social engagement, social publishing/promotion and performance measurement. Tools that really do all those things can cost as much as a full time employee or more, depending on how many “seats” or use. Deciding which social management tool is best for you requires you to do some homework. There’s no getting around it. You can start with something basic like HootSuite or Sprout Social and move up to Salesforce Social Cloud, but ultimately you’ll need to do an inventory of your needs and reconcile that list with the features of credible tools. To shortlist potential tools, I’d recommend talking to industry peers and asking them what tools they use. This is something I plan on doing through a formal survey later in the summer. Once you’ve identified a tool, test it and evaluate. Also understand that you’ll need to consider what the upgrade path is as your needs evolve. It’s not too surprising that marketers consider social media strategy long after tactics. Many companies simply don’t know the answer to “Why”, let alone “How” a social media presence will advance customer and business goals. But knowing the “Why” is essential for guiding approach, tactics and all the mechanical blocking and tackling of daily social media engagement. This is especially true in the gray areas where guidelines are not specific. The social web is so dynamic, you couldn’t possibly account for every contingency in your social media policy. That’s why a clear strategy with brand goals and an understanding of customer goals is essential. I’ve covered social media strategy many times here through “What is Your Social Media Marketing Strategy“, “Social Media Strategy – A Definitive Guide“, and “Social Media Marketing: Strategy to Commerce“. I also cover specifics of developing a framework and strategy in Optimize. Essentially, a social media strategy starts with a hypothesis about how your brand’s social media participation will connect with social networks and customers in a way that achieves mutual goals for the brand and community. What information, interaction and experience needs can you satisfy for communities that are relevant to your areas of expertise? Answer those key questions and you’ll be on your way to mapping out a solid social media strategy. [Lee] Why do you think tactics is so much higher in priority than strategies? [Mike] Because there has been so much change in all the major social networks in the last 12 months, it really makes sense that marketers want to learn how to leverage the latest capabilities of these networks. [Lee] The report states that 83% of marketers are struggling with most aspects of social media. Does that indicate companies are really nowhere near maturity with social media? [Mike] As in any emerging industry, these responses clearly show that the social media marketing industry is in constant flux. Anyone who claims to have ‘figured out’ social media marketing will quickly be outdated in a matter of months. [Lee] How do you think marketers interest in these questions about social media will shift over the next year or two? [Mike] Funny thing is that fundamentally marketers have been asking the same questions for the last five years based on our research. I see no reason to believe that marketers won’t continue to struggle with these questions for years to come. When it comes to asking questions, you know the old Chinese Proverb: ”He who asks a question is a fool for five minutes; he who does not ask a question remains a fool forever.” So, what are your most pressing questions about social media marketing?